Welcome to my Monthly Goal Report! 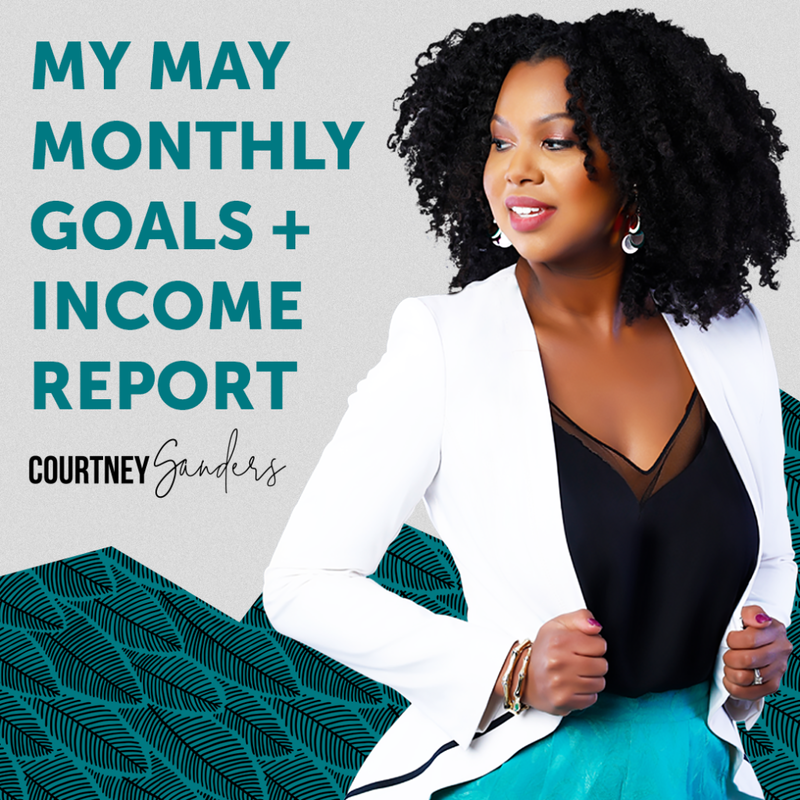 (Formally “The B-Side”) If you’re new, at the beginning of every month, I share my goals for the coming month, how I did with my goals the previous month, and lately, I’ve even been sharing income reports (eek!) as I work to grow my business and take this thing full-time! 1. Fill my new mentorship program. I was successful in enrolling 4 new mentees in my 4-week Make it Happen Mentorship program. I’m actually wrapping up with them now; boy does time fly! I really enjoy helping women meet their personal and professional goals so I’m kinda wondering why I didn’t offer this program sooner! This is something I want to do every month, as long as my time allows. 2. Enroll 2 new clients in my VIP sales and marketing program. Close but no cigar! I spoke with literally maybe 50 women who are all interested but none of them were quite ready to pull the trigger in April. That said, I’m in talks with a few of them to get started this month, so I’m still happy that I put in the work I did in April. When it comes to 1-on-1 clients, I’m learning the goal is to stay in constant contact with prospective clients who are interested in your services. Some people take longer than others to make a decision to work with you, so it’s important to have a constant pipeline of potential customers who want to work with you. 3. Successfully launch my “life reset” challenge. Done! I even exceeded my target enrollment of 2,000. (Nearly 2,200 women joined!) This was way more successful than I anticipated – the number of emails I got from women disappointed that they joined late was crazy! Also, I was really pleased with the feedback I received from the challenge – many women had breakthroughs while participating and for that, I am grateful! 5. Keep up my fitness routine. Womp, womp! I’ve only been averaging 2 workouts a week which is way below my normal 4-5 days in the gym. I started off really strong at the beginning of the month but as things heated up in April, I found myself taking a lot of calls in the morning, afternoon, and evening, which are all times I would normally do my workout. To combat this, I’ve blocked out specific workout times in my calendar each day so no one can book appointments at that time. I didn’t want to have to do that – generally I was squeezing in the workout wherever it fit but I’m learning I need to be more intentional about when I workout every day. 1. Fill my new mentorship program. The goal is to repeat last month! 3. Get my new bookkeeper all setup – for real this time! Seriously, I want reports in hand by the end of the month. I’ll be calling my bookkeeper today! 4. Setup the foundation for my new membership program. During one of my morning journalism sessions, I had a BRILLIANT idea for a monthly Think & Grow Chick membership program! I’ve very excited about it but before I can launch it, I need to setup an actual membership portal on my website. This month, I want to get all the tools and tech in place so that I can launch the membership shortly thereafter. Stay tuned! 5. Setup a clothing budget and begin building my TGC wardrobe. Recently, I was offered an opportunity that I can’t yet speak about but if it goes through, it would completely take my brand to the next level. In sharing this opportunity with my best friend, she immediately was like, “Omg! What are you going to wear! If this happens you would have to COMPLETELY step your style game up!” And she’s right! Even if the opportunity doesn’t go through, I am very much the face of my brand, so it’s important that I look polished at all times. Not that I don’t now, but I’m starting to get more speaking engagements (like the Powerful Women’s Weekend in Detroit this June!) and generally need a “Think & Grow Chick Wardrobe” that is appropriate for all these events. Because I’m so busy, I know this will never happen unless I budget for it and start shopping online, so my goal is to come up with a weekly budget I can put towards refining my “entrepreneur wardrobe.” This is yet another reason why I need to get moving with my bookkeeper ASAP. Wearing all the hats in my business. Though I do have an assistant, a web developer, and sales and advertising coach, sometimes I laugh at myself because in one day, I am literally standing in the role of like, 10 different would-be employees in my business. In any given day I am the CEO, the customer service rep, the sales rep, the project manager, the financial auditor, the tech support rep, the marketing director, the advertising account exec, AND the entire product development department! It’s hilarious but sometimes stressful because in addition to running the business, you have to get new business. If you don’t have a steady flow of new business coming in the door, then you don’t have a business. This can be very difficult to balance when you also have to run the business. Of course, I could always hire more people but I have to balance growing my business with keeping my expenses down. So it is a conundrum. Not sure how I’ll ultimately fix this but until I find a solution, I will keep plugging away! The goal of these reports is to be transparent and support each other, so be sure to read all the comments and check out all the participating blogs and businesses! If you have something to offer, leave a comment and help each other out! If you are a blogger, feel free to create a post sharing your goals, challenges, and successes (via the format above) on your blog and link back here.